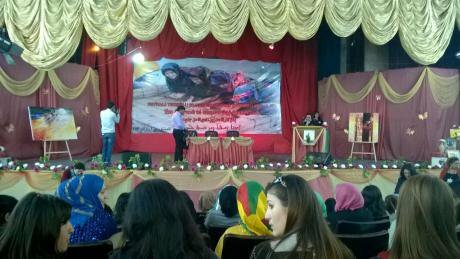 While I am in Rojava in northern Syria, the very first women’s art and culture festival takes place over four days. In a rundown theatre, a large number of women of all ages and ethnicities read/perform poetry which is impossible to translate simultaneously except in broad brush strokes. So I learn that the poems are mostly political – pondering on the war, the Kurdish question, women’s subordination and the tragedy of fellow Syrians abandoning the country and becoming refugees. Unfortunately, the poems are delivered either in plangent tones or at ear-piercing volume, defeating all my attempts to be a sympathetic listener. The paintings, by contrast, speak in a universal language. First women's art exhibition in Rojava. Photo: RGI wonder if the political nature of the poems is an attempt to bolster the revolution comparable to the partisan nature of Soviet art from the 1930s onwards. The organiser, Berivan Khalid, Head of Culture in Cizire Canton, tells me that while ‘they hope to represent their revolution to the world through art’, no selection process took place. She assures me that there was some love poetry but the overwhelmingly political focus reflects the concerns of the artist in revolutionary times. All women over the age of sixteen were invited to participate in the festival and all were showcased. The festival had put out a call for entries across all the cities of Cizire canton. If quality was not a determining criterion for entry to the festival, the egalitarian nature of the entry process did not extend to the awards ceremony where three of the best in each category would receive prizes. The significance of the event though is not lost on me. Under Assad, any public expression of Kurdish identity or celebration of Kurdish arts and literature was criminalised. Khalid says they have experienced a 180° turnaround in their freedom. Speaking Kurdish in the workplace and other public places as well as teaching and learning the language was illegal. In her book, The Kurds of Syria, Harriet Allsopp says that organisers of Kurdish weddings had to sign agreements with the state that there will be no singing in Kurdish! Traces of the Arabisation policy of Assad are everywhere to be seen: from my media pass written in Arabic to help me through checkpoints to interpreters who are more comfortable in Arabic than Kurdish although they identify as Kurdish. Now, Kurdish language courses are flourishing; I also come across a number of adults who are more fluent in Arabic but are learning to read and write Kurdish to counter that. However, the women of SARA in Qamişlo, the capital of Rojava, an organisation much like Southall Black Sisters in the UK, which supports women escaping domestic violence were far more relaxed about pointing out that Arab women face greater problems than Kurdish women because polygamy was much more extensive in the Arab community, as were honour killings. Given the long history of tension between the Arabs and the Kurds, I wondered whether these statements were inflammatory. However, the power equation between the two communities is quite different. The fact that the Arabs constitute a powerful majority in Syria versus the discriminated against Kurdish minority might be one reason; it is more acceptable to punch upwards. Rojava’s emphasis on ethnic inclusivity might be another. In the Legislative Assembly, their equivalent of Parliament, they have reserved quotas of 10 per cent for Kurds, Arabs and Christians respectively, regardless of the actual size of the communities in a region where the Kurds are in a majority. This is a really enlightened approach to racial inclusivity. In this context, an assertion that the position of women within a particular community is worse than in another isn’t received as a racial slight but as a statement of fact. It was precisely this inclusivity that attracted the Arab shopkeeper who I met in the souk in Qamişlo. He had fled from Raqqa, partly because he was disgusted by their persecution of all other religious and ethnic minorities. Of course when I asked about his commitment to the revolution’s ideals of gender equality, he robustly disagreed and said that his wife’s place was definitely in the home. He does appear to be in a minority if a recent survey carried out by the self-administration is anything to go by. Of over 1200 people surveyed, approximately 500 men and 700 women, 85 per cent agreed that women should have equal rights. Almost all the questions relating to improvements in women’s status, received support from 80-90 per cent of the respondents. Interestingly, the question that received the least support – 65 per cent although that is still a substantial majority – related to women’s rights after divorce, whether a woman should have custody of the children until they turned 15 and whether the father should be obliged to pay alimony. Until the revolution, Syrian sharia law decreed that if a divorced woman did not remarry, she could hold on to the boys till the age of nine and girls till the age of eleven. 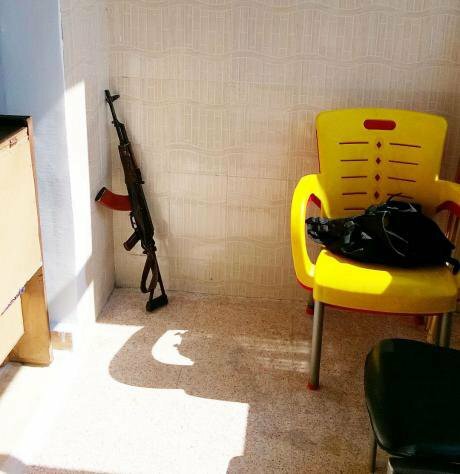 While sharia courts have been disbanded in Rojava, they thrive in other parts of Syria which are under the control of those Syrian rebels, infiltrated by Jabhat al-Nusra, an al-Qaeda affiliate or the Muslim Brotherhood, and of course, in ISIS held territory. Rojava’s commitment to secularism, where religion is strictly a private affair, owes much to Abdullah Öcalan’s ideas. He is very clear about the role of religion in the oppression of women. In his pamphlet on women’s revolution, Liberating Life, Öcalan advances his three sexual ruptures theory of women’s enslavement and eventual liberation. The first rupture, or turning point, was the rise of patriarchy when Neolithic times ended and ‘statist civilisation’ arose; the second sexual rupture was the intensification of patriarchy through religious ideology. As Öcalan says, ‘Treating women as inferior now became the sacred command of god’; and the third rupture is yet to come, the end of patriarchy or as Öcalan puts it, ’killing the dominant male’ which is about reshaping masculinity so that it no longer defines itself in relation to its power over women. This is the society that the women soldiers want to defend. When I ask Nesrîn Abdullah if she has come face to face with an ISIS fighter, she nods but refuses to go into detail, ‘It is not important to me if I kill an ISIS soldier, the most important thing is to kill the ideology.’ She is very keen to emphasise their philosophy of peace and defence, of non-aggression and fighting back only when invaded. It isn’t merely the idea that women have the physical courage to stand up to the brutality of the ISIS fighters – an idea which was fleshed out by pictures of YPJ women rescuing Yazidi women and children from Mount Sinjar – but that the encounter between the two sides is bigger than that, it is an encounter of two very different political ideologies, of democratic modernity versus religious fascism in which the position of women could not be more polarised. Surely this battle between Rojava and Raqqa puts paid to the popular Western narrative of the clash of civilisations proposed by Samuel Huntington. In 1992, he argued that the age of ideology had ended and the future would be characterised by cultural and religious conflicts. Central to this line of thinking was a clash of cultures between the morally superior West in terms of its support for human rights, equality, democracy, liberalism and the medieval attitudes of an Islamic ‘culture’ constructed as monolithic and universally opposed to these values. What I saw in Rojava is an attempt to build a radical democracy as described in Part 3, the like of which does not exist in the West. This battle is not for some mythical soul of Islam; it is being fought ‘outside of it’. Even if it looks as if ISIS is determined to impose its particular brand of Islam, the Qu’ran is simply its political handbook.